Being in Ponyville always brought some... very conflicting feelings up in Bevel. The memory of the type of mare she was before she even came here was still fresh in her mind and it an image she dearly wished she could forget. Thankfully, she managed to schedule something that could keep her from being completely alone with her thoughts on this trip: A tour of the (relatively) new castle of Princess Twilight, and the company that would be with her for it. In this case it was her good friend Dunnie, who had come to her with a problem that Bevel was able to find a treatment for. Now the treatment evolved somewhat to where her friend was able to keep her new look indefinitely so long as she kept her bracelet on. The guide for this tour was someone Bevel had come to know through a regular customer of all things. When they'd first met the inventor knew she was a guard, but she definitely didn't realize that she would soon become more literal example of a royal guard: Being a guardian to none-other than princess Twilight herself. A couple letters later she managed to arrange a trip through the castle... aren't connections wonderful? Fire Walker paced back and forth in the elaborate entrance of the 'Castle Of Friendship'. It had not been that long since the member of the royal guard had been given a new title, job, and new suit of armor. This also came with an rather impressive scroll that listed her new responsibilities. One of them was back-up tour guide for the 'Castle Of Friendship'. Today she would be testing herself on how much of her script she was able to put into memory. The mare still could not get over how such an impressive castle could have been created so quickly via magic. 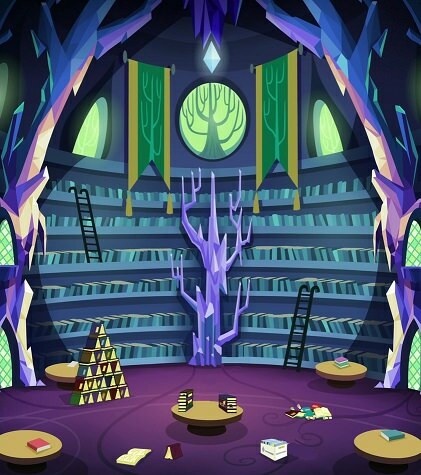 Once there was small tree that had been transformed into an home and library , but after an rather angry minotaur came along, it was now an Crystal Empire inspired fortress in its place. OOC: Per Dunder..Just assume Fire opens the doors during your post..
New beginnings: part of the reason why Dunnie had chosen to come to ponyville at all. With her new looks, it was almost like she had never stepped into the town before. Not that she was tunning away from her memories of the town, instead she wanted to create new, happier ones. And in what better company than that of her good friend Bevel. Such a sweet mare, helping out a friend in need in such an ingenious way. As they made their way to the castle, Dunnie looked at the bracelet around her left forehoof. It was currently gold, and giving off a brilliant shine in the summer sun. To imagine something so simple could cause such a change. Her mind was snapped back to reality when she heard a familliar accented voice. "Oh! Does it seem like it is not working? I only saw myself in the mirror for a moment this morning, but I saw a mare." In an instant she became a bit flustered, she brought a wing up to brush her mane, which was long and brought down, straight at the top but a bit wavy near the bottom. "Also you said your friend was the one who got us the tour." She said, a bit scatterbrained as usual, "Did you say who the friend was?" Clank A mechanism in the door sprung to life. "So they were expecting us." The door began to swing open, "I hope we aren't laa--" her eyes shot open when she saw the red mare inside the castle, "Fire?!" "It's working perfectly fine: You look wonderful. "Bevel chuckled at Dunnie's fretting, "Are you worrying that one of -my- creations might falter in someway?" She gave the grey coated mare a gentle nudge to the side as she saw the doors beginning to budge. As the sound of the large gate opening reached Bevel's ear she let out a yawn, a big enough one that noises seemed to grow soft around her. Soon enough she realized the follow up questions posed by her companion, "That's right! She's the fiancee of a loyal customer of mine, Her name's--"
"Now-now. No need to interupt... Even though that is correct." A feeling as if she'd missed something began to rise in her gut. That tone Dunnie used implied she knew Fire Walker already, "Oh! Have you met her before?" She asked with an excited gleam in her eye. The inventor bowed her head towards the red pegasus and whistled, "Bonjour, Feu Walker! I love the new armor, it works very nicely with you coat!" Oooh! They’re here! They’re here! Fire Walker could hear someponies behind the door! After she took a look through one of the purple stained glass windows located near the door, she could see the vague appearance of two ponies. Probably female. Both a brownish sort of color. The window was made to look good, not to be seen through! One of these mares had to be Bevel! And not Pinkie. Thank goodness! The officer’s very good friend and Royal Equestrian Army enchanter, Ilinalta came up with a fun little device. It was a small, flat pad. Throw it on the ground and give it a good stomp, and it would play music! This one was made just for the test and would probably never be used for the actual tour unless fully approved by Princess Twilight. It was just a bit of fun for now. “Welcome, Welcome, One And All! “To Ponies Short And Ponies Small! “Welcome To All Creatures Whoever You May Be.. But that pony was a mare. But it HAD to be Dunder. Very few ponies knew the stallion as well as she. Fire Walker knew where ever fuzz and even every freckle was on his body. But there were curves where curves should not be. And the snout. And the EVERYTHING. She was aware of his sister, but she was still a child! Oh dear, was Twilight up to more of her magical mischief? She zapped the officer and her friends into kids not that long ago. She managed some murky magic on Prince Blueblood and made him into an she. And there was even that bit with turning regular old ponies into crystal ones at last Hearth’s Warming. She might have been responsible for the strange pumpkin that nearly ate her sister Wind, and her friend Bebop. Her jaw came very close to hitting the ground. “Gra...Hello Miss Gear. Dunder. Please come in.” Hopefully Dunder was having a little bit of fun with old friend. It all made sense now. 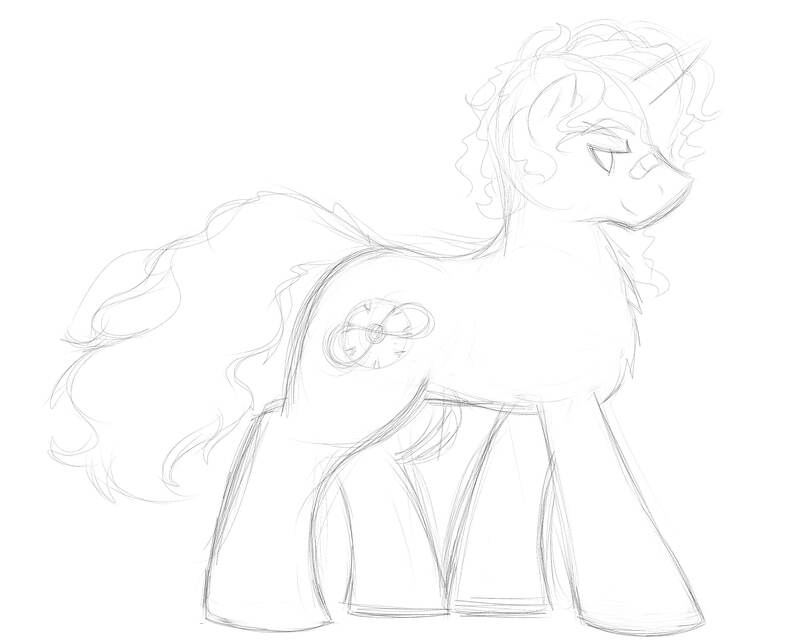 Every last bit of luck left for Dunnie was used up with Bevel offering to turn her into a mare. After the vacation to the changeling isles and going back to work at the Blueblood manor, all that has followed the transformation have been encounters with ponies who have known her since before the transformation. Even though she knew that such encounters would eventually happen, she had hoped to enjoy life as a mare and suffer awkward reunions later. However, it seemed fate put Dunnie against one of the last ponies she wanted to see again. Her legs locked up, her teeth gritted, ever muscle in her body stiffened up. What will she say? What will she think? Will she keep being my friend? Will she never talk to me again? Thoughts of fear buzzed through her mind, but the jig was already up. There was nothing to do, except to prove how minimal the differences were. The look of shock slowly gave way to a wide smile. "Fire!" She zoomed to embrace the red pony, squeezing her tight and nuzzling her neck. "Long time no see!" Fire would get a whiff of Dunnie's perfume which carried a light fragrance of fresh strawberries. "How have you been? We need to make sure to keep in touch better!" Greeting her like this felt natural. She was still the same pony inside, even though her appearance changed. "Oh, yes." Dunnie released Fire to look at Bevel, "We have known eachother for a long time, actually. Went on quite a few expeditions, ey, friendo?" She beamed at the mare, giving a light nudge with a firehoof against the chest. The last thing Bevel expected to hear once the door opened was a musical number. Hearing Fire's voice was probably pretty high on the list , but hearing her singing was probably somewhere down in the middle of it: Just above tap dancing and below harmonica solo. A couple questions popped into the inventor's head after this impressive welcome, but she swept them all aside to give her friend a bout of applause. "Tres bien, Feu walker! Tres bien! ... You stumbled a little bit towards the end though." A playful little chuckle escaped her before she noticed the strange expression on Fire's face, "Is something wr--"
... And then Dunnie pounced. A smirk creased bevel's muzzle as Dunnie gave her a affectionate hug, "Well at least it seems you last parted on good terms!" While Bevel ascended the steps after her flying companion (some of us couldn't just zoom over to their friends) She would carefully pick up the step activated music player, "Oooohh... Who made this?!" Ho-Boy! This REALLY knocked Fire Walker off her script. She was going to start with her little song, which she did for the part. If the song had properly ended, colorful, festive confetti would have shot out of the ‘pad’ along with a festive squeak. It would have been cute and they would have fully moved into the castle for the tour. She had considered talking Spike into helping her. Considering how adorable he looked in his little heart-bestowed apron, but their schedules did not work out. There were a few fold out tables in the entrance topped with food and drink. They were obvious rentals. “We are getting more suitable tables, but for now, this is what I would say represents some of the best from Ponyville.”, she stood near the displays. “Cider from Sweet Apple Acres. Non-Alcoholic obviously, but very tasty.” There was another table topped with sweets. “And an variety of flavored cupcakes, compliments from Sugar Cube Corner and Mr. and Mrs. Cake....Now normally, there would be more depending on how many would be going on the tour. I'm hoping we could get some of the school-ponies to draw some pictures of what Ponyville and the Castle Of Friendship means to them. Maybe even arrange Lady Fluttershy is have a few of her little bird friends to chirp a nice little song instead of the per-recorded stuff. Again, this is all a work in progress. If you would like to spend a moment to enjoy a snack and marvel at the high, vaulted ceiling." The normally very calm mare pulled out a small Sugar Cube Corner paper bag and started to inhale into it directly. "Oh. ", Fire removed the bag from her mouth. "The music device I used was created by head enchanter Ilinalta in the R.E.A. I believe she is considering calling it, 'Ilinalta's Tiny Orchestra'." And then it was back to the bag. "We used to date." The words stung, but not as much as they used to. The words that really hurt, that realized Dunnie's worst fears, was Fire insisting that Dunnie needed "fixing." On top of Fire's refusal to return the hug. The tears welled up behind her eyes, as fears of losing one of her oldest and best friends surfaced. However, Dunnie held back the tears, as crying and causing a scene would only make things worse. As Fire showcased the golden cider and the brightly colored cupcakes, Dunnie could only look at them with an abject gaze. However, the cupcakes could offer some temporary comfort given the circumstances. Dunnie ripped the wrapper off one, eating the whole cupcake in one bite while listening to Fire explain her ideas for the castle. By the end of Fire's monologue, Dunnie had gotten through 3 cupcakes and was holding out a fourth to Bevel. "They are very good. The chocolate ones are better." She said while maintaining eye contact on Fire, who was now breathing into a paper bag. Dunnie approached her, "Fire, you're overreacting. There is nothing to be freaking out about, there is no part of me that you need to fix. The magic can be undone at a moment's notice, if we so wish." Dunnie said, motioning to the golden bracelet on her fore leg. While putting her hoof down, she resisted the urge to stop the ground. "You're just going to have to accept it." Her voice stayed strong, not revealing the burning fear in her gut. "Only if it would make you feel better," She spun around, and trotted back towards Bevel, "We could showcase this device?" The mare's yellow eyes bounced back and forth between Dunnie and Fire for a moment, "...You both Dated?" It really was a small world. As Fire gave the par a rundown of the various eateries available in Ponyville, Bevel was left speechless and staring at the great spread of sugary treats. If she had any digits she'd pinch herself to make sure she wasn't dreaming. What part of her mind that had any semblance of self control kept her from just jumping onto the table and digging in like a vulture griffin. That part of herself wasn't strong enough to keep herself from making the cupcake on dunnie's hoof disappear in the blink of an eye then smiling innocently at her companion. Bevel would step up to Fire and gently pat her back as she inflated and deflated that paper bag. Sugar cube corner certainly sounded good, although really anything with the word sugar in it sounded remarkably good for the curious inventor. While Dunnie spoke up Bevel continued to admire the work of this Ilinalta... and made sure to commit that name to memory. Such a device could be a potentially lucrative opportunity if utilized well. There'd be quite a few questions she'd have to ask though, like if this mage owned the rights to such a device just yet. Dunnie's question managed to snap her out of her inspiration induced trance, "Wha-Oh! But of course!" The mare held out her hoof and bumped her bracelet up against Dunnie's own. In a magical flash, the two mares beside fire were turned into stallions! "Taa-daa!" 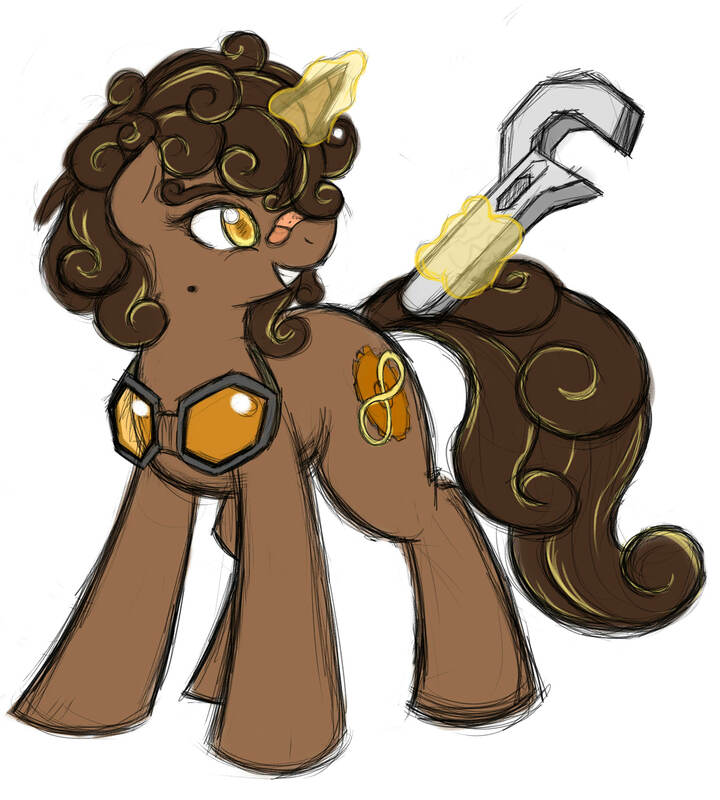 Spoke the now baritone inventor with a proud smile and puff of his chest, "These bracelets make use of--" The terms that the now much stockier looking unicorn spoke up more or less sounded like compelete and utter gibberish to those not deeply knowledgeable of quantum aetherology. Once he stopped talking he would then blink and look himself over, "I still can't get over how much I resemble my cousin like this. If it weren't for the horn and much nicer mane, I'm sure we could pass for twins." No, it could not be Flux as she was an very gentle soul and would never be part of anything this cruel! Still, Fire caught something familiar in the mare's eyes and it made her feel like her heart and turned to stone. "Oh, I'm sorry Dunders." Sweet Celestia! You think you knew everything about this guy! Was this a recent thing, or was he always a 'mare trapped in a stallion's body'? Her mother's brother, Red Wood liked to wear his wife's Angora sweater...But had no desire to became a mare. He just liked the way the poofy sweater looked on him, and it smelled like his beloved. Was this an leftover effect from the whole 'Ice Storm' marriage fiasco? "I just planned this whole thing out in detail and your little surprise completely threw me off guard...", with the help of her right wing, the mare crumbled up her bag and tossed it an nearby 'Royal Rubbish Bin'. "After this little tour, we should have a drink together. They opened up this cute little microbrew nearby and it has the best view of the castle. We could talk. Catch up on things if you wish." Fire Walker was back to her usual, calm self. Maybe having Dunder as a gal wasn't such a bad thing. At least 'hanging out with a gal-pal' was less suspicious than spending time with your ex. The officer could not help but smile as her friends enjoyed the little snacks. One particular item caught her eye. It was an festive little red cupcake with an Snickerdoodle sticking out of the frosting! She gobbled it up with one might bite! Oh, how she loved the Cakes! Not only did this wondrous cupcake include her favorite cookie, it was cinnamon flavored! This meal came with a show, as both ponies used their new magic devices to transform into males. "Do these bracelets simply project hard light illusions, or are they true polymorph spells?" The higher illusion spell could not only make it appear that Dunder had been changed, but also would be strong enough that she could touch Dunder and actually feel something and even smell her as well. An Polymorph spell actually transformed its subject into something else. Being an officer, the mare had to take more than a few classes on magic. And while she could not cast spells herself, she would be required to be able to defend herself from magic...along with understand how certain spells work. Once the treats were enjoyed and magic was explained, Fire Walker was ready to start the tour! At this point, Dunnie knew to look away from the flashing light. She didn't know how strong it appeared to the spectators, but so close the magical light could leave a pony blind for a few minutes. When the flash from the spell had dissipated, all that was left standing were the figures of the two stallions where the mares used to be. As Gearbox got to explaining the magic using jargon that will fly over most pony's heads in his regular jovial demeanor, Dunder suddenly became apprehensive. His already melancholic behavior dropped further, along with his head which now hung low while his hoof kicked idly against the castle floor with soft clacking. Though, when Gearbox spoke up about his attractiveness, the stallion smiled and stifled a chuckle. "You are a rather attractive stallion. And as a mare. I guess you got pretty lucky." He said, his voice low, barely loud enough for Gearbox to hear. He lifted his head to look straight at the re mare before him, "Oh, and we can go to the microbrew if you wish. But there isn't really much to 'catch up' on." He said, leaving out his thought that he could really go for a drink right about now. For they had to continue with the reason they all gathered. "Let us begin the tour." He said, still speaking softly. He turned to face gearbox, "But first...." He held out his hoof with the bracelet around it while looking down at the slightly shorter stallion. The stallionized mare would shake her head at fire's microbrew offer, "I'd be happy to have a drink with both of you but I don't do alcohol. I like to keep my mind sharp!" She took a moment to look over her now much larger hoof, only snapped out of her analysis by Fire's next question. Almost immediately the brown unicorn's ears perked up and a delighted grin spread over her face. "Now that is a fun question! The short version of the explaination is that Starlight Glimmer helped out with the devices spell power, it is a true polymorph spell but it replaces and and constantly rotatesthe trans-aetherial feedback matrix back and forth with cutting edge magical circuitry and a degree of pact based mana enhancement loops to produce the sustained effect. "She said with a proud smile as she held her invention up above her head. "It's still a prototype though and not ready for any mass production." She happily bumped the bracelet with Dunnie's, "Either way, I still prefer this look:Even though I'm a tad shorter." She pulled Dunnie into a sidelong hug, "Well someone's in the mood for flattery I see!" “oh.”, the mare managed to squeak out. It was now her turn to look a little upset. This did not last as she was an proper Canterlot pony and she always needed to keep a stiff upper lip! But even years of training only managed to shift her frown into a neutral expression. Was her Dunders...oh...he’s not ‘hers’ anymore. How was he doing? She assumed her former beloved would be either wowing dining halls with his unsurpassable cooking skills or even going on exciting adventures! Maybe he would have gone on an exciting adventure that lead to him cooking one of his special feasts afterwards. Turning an foe into an forever friend. Or did he spend most of his time feeling sorry for himself? Moping around in his apartment only in his underwear? And Fire sure had a ton to talk about...But if his life wasn't going so well, she probably would sound like a big ol' bragging bragger-face. Fire Walker glanced over at Bevel with a shrug. Weird, she always assumed the mare probably enjoyed a glass of wine or two. And somepony once said, 'Wine can be a better teacher than ink, and banter is often better than books'. And she was talking about Starlight Glimmer? The former cult-leader and near destroyer of all worlds? She was a very powerful spell-caster and even managed to hold her ground against an Alicorn in battle. Mind you, it was an newly minted Princess Twilight, but she was still pretty tough, and how she held one of the most thankless jobs one could have in a school, a guidance counselor. She should be teaching at Princess Celestia's school, for pony's sake! A true polymorph spell controlled by an device? Holy smokes that is impressive! "Mana loops. Wow. ", She could see this being used for all sorts of mischief. The mare smiled as the inventor gave her favorite brown stallion a hug. He deserved at least a hundred more of those. She lead the pair toward an large opening bordered by dark purple crystal. 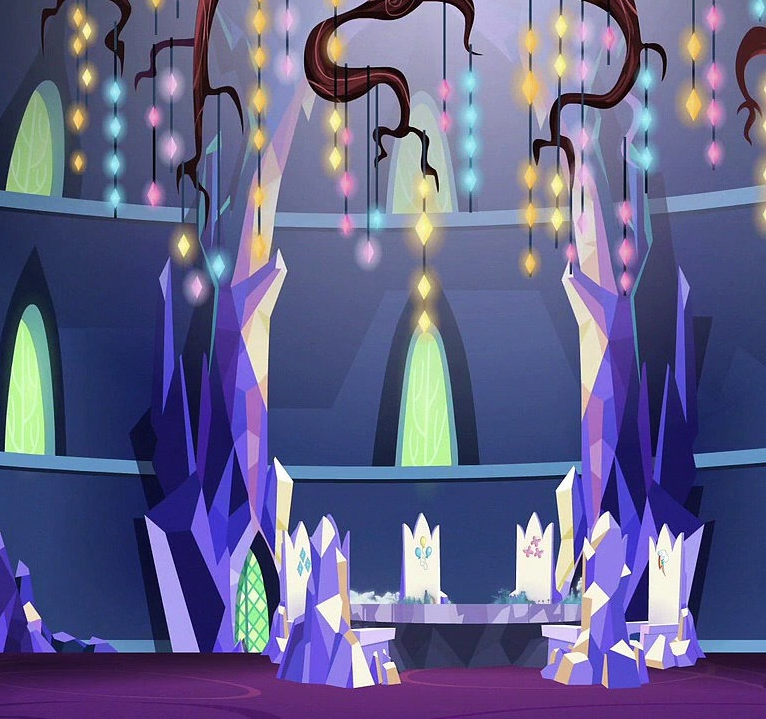 In the center of the room stood what appeared to be an map of Equestria which in turn was surrounded by chairs carved from crystal. These chairs were marked by the familiar markings of Princess Twilight's companions. "As you all can see, this is an three-dimensional interactive map of Equestria. ", she HATED what they normally called it. The 'Cutie Map'. "This rather unique piece of magic actually detects quandaries in our kingdom and picks the best suited candidate or candidates to fix said problem. ", she cantered up towards the map. "This is not just limited to Princess Twilight and her companions, but can actually call any of us....After the problem is detected, the right ponies are picked and their cutie marks will actually glow and let off an rather annoying sound. And will glow once again after the problem is fixed." She hoped this sort of knowledge would be given out more as it sure would scare the heck out of her to be awoken to the sound of mark on the rump as it buzzed and glowed. "Any questions so far? ", she asked her 'group'. Dunnie gave a sidelong smile to Bevel as she was embraced suddenly, "I think this form is much preferable too, personally. However, being tall is a little overrated when you have wings." She said, flexing her own and looking back to appreciate them. "Though, I suppose magic is useful to reach things on a high shelf too." She commented and gestured to her friend's horn. "Also if we went out for a drink, I'm sure they'd be more than happy to serve you something soft." She suggested, then shrugged, having already noted that she had never seen Bevel partake in alcohol before. However, as pair began to follow the red mare, Dunnie's head hung a bit lower. The rush of emotions that had just gone through her and Fire was enough to keep Dunnie feeling a bit ill. Though, she kept going on, perhaps by the end of the tour their hearts would calm down a bit and they could make some sensible plans. She still loved her crimson comrade and was unwilling to let something silly like changing into a mare get between them. As they entered the opening, her eyes went wide. Looking like a fantasy novel come to life, the table was surrounded by six chairs, the jagged edges of the crystalline furniture was fitting for a castle that had supposedly sprouted from the ground. She listened to Fire speak as ashe trotted around the table, examining the table and each chair with a curious gaze. At Fire's question, Dunnie spoke up, "What happens if you are asleep or something and you don't hear your cutie mark make the annoying sound?" Bevel's hoof imediately shot up, "I have many! How does it do this? Is it some form of greater magic tied to the map, is there some sort of magical intelligence guiding and calculating the fates of ponies and other beings all across the land?" With each word Bevel would scoot closer to the table, looking all along the sides and gently prodding the sides of the map, perhaps hoping to find some sort of compartment. "Seems to be some sort of crystalline substance... but it was clearly grown rather than assembled." The prench mare gave the side a gentle tap, "Has a strange feeling to it when tapped, sort of like wood..." Her attention then turned to the six chairs in the room, "... I must say that the chairs don't look very comfortable." "From what I've been told. ", Fire Walker smiled at her old friend after she asked a good question. 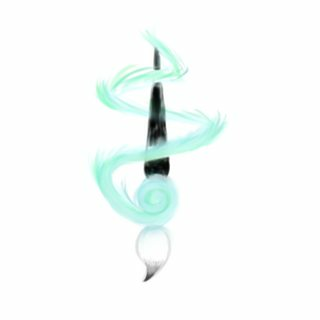 "Along with one's markings lighting up, the summoning also causes your markings to pulsate, so if you could not see or hear the alarm, you would also feel it. The map also projects an image of your cutie mark which pinpoints the location of the 'problem'- ", Fire Walker walked up close to the table. "Considering these are 'friendship' problems and not 'end of the world' type issues, the 'Cutie Map' seems to alert the pony it picks when they are awake, although that might not always be the case." Some friendship problems could be more severe than others. Bevel also had her own questions. "I almost wonder if it's tied into the very heart of Equestria itself. ", the mare mused, "And yes, I agree with you. There must be some greater magics behind this. There is something behind this map that can see problems and not only find those who can fix them, but find the right creatures best suited for the job." Once the pair were ready to move on, their tour guide spoke up, "Now if you follow me, there's another room I'd like to show you.."
Heart of Equestria... What even could even be such a thing? The collective will of all ponies? An entity greater than both of the princesses combined? Would an entity of that power remain neutral for long? Thoughts raced through Dunnie's mind as the power of the magic table before her was revealed, even if the source of such power remained mysterious. At Fire's explanation, she nodded slowly while listening. Her eyes locked on the table throughout the explanation. A very knowledgeable pony indeed. "I suppose the princess is lucky, then, that her old residence was built atop this powerful magic?" She chuckled lightly, "Or maybe this castle would have followed her wherever she went?" Dunnie pushed herself onto her hindlegs and did the best shrug that she could. No protest came from Dunnie as Fire moved the tour along, she dropped back to her hooves and followed silently, getting close to Bevel. "I really hope that I don't get called... suddenly feeling my plot shake without my command would be worrying at most and embarrassing if I had company." The inventor leaned carefully over the map, admiring the devices accuracy in regards to the Equestrian topography, "Moreover I'd hate to have to take time out my schedule to try and fix someone else's problems..." She grumbled, perhaps that was the griffin upraising talking. Bevel took one last glance back at the map before she joined along with her friends, "Oh-ho! What's next?" She asked in a tone of both excitement of wonder. "Is there an armory? a changing room? Do they have a pool in here too?" All these questions were asked with no hint of sarcasm. "From what I've been told, the castle was created when the "Tree Of Harmony' released what appeared to be a chest. This in turn was sent to Ponyville, where it opened and in mere moments, this castle was formed." Thankfully it landed on an empty lot and not on somepony's home. Or hoof. Fire Walker was curious why it looked so much like a building from the Crystal Kingdom. Was it as crystals were excellent at holding and absorbing magic? Or maybe it was just a really popular design choice back then. The castle itself usually stood out like an sore hoof until the later creation of Twilight's school, which stood nearby. The designers picked the castle's colors while the building itself was more an blend of Canterlot modern crossed with Ponyville folksiness and charm. They even incorporated the nearby waterfalls into the school, and Fire sure loved her some Celestia darned waterfalls. So beautiful and so relaxing! She could watch them all day! "Miss Bevel? ", she gasped, "We should always have time for others. And. ", a grin formed on her face, "The map is not going to ask you to paint somepony's fence or walk their dog, but it will find the most suitable person within an reasonable distance that could fix the problem. And from what I've heard, these have been rather interesting issues that had been fixed via the map. From planting the first seeds of Griffonstone's revival to ending an centuries old feud between families. I heard it even works on non-ponies now." As they made their way towards the next room, the red coated mare let out a chuckle, "Armory? This is the 'Castle Of Friendship'...You're not gong to find any Glaives or Plançon a picots here. ", she added before she pushed open the door, "There are small changing rooms located in the public restrooms near the entrance." While she was curious while the clever inventor needed such rooms, it was time to move on! "This is one of Princess Twilight's favorite rooms...As you can probably guess why." They were now in a rather impressive library filled with books of all sizes and colors. Fire Walker glanced around for a moment. "Mister Lore Weaver? You here? ", she called out for the librarian to see if he was about. This was the -public- library part. It housed impressive, but safe books. There would be no copies of the Necronomicon Ex-Mortis or Occido Lumen here. Those books would be stored in special shelves far away in Twilight's little pocket universe. "Wait a second? ", she glanced back at Bevel, "Did you ask if we have a pool? In here? As in a swimming pool? ", The unicorn as acting rather strangely. "Can't say there is...We have a couple of small water fountains...One in our break room and the other over there. ", she waved at a small, crystal fountain surrounded by comfortable, purple benches. "Please feel free to look around, and if you have any questions..Just ask.."
Hopefully the answers will be in her scroll somewhere. "This castle was built but in a few moments?" She asked, noting the jagged chunks of crystal jutting out of the arches and generally just posing a safety concern. "I guess, at least it has rooms actually built? Instead of just being a giant monolith of crystal." She asked while scraping a hoof gently across the point, seeing how sharp it was. While she hoofed mindlessly at the jutting out crystal, she listened in on them. She hoped that a magical force who is omnipotent would know how not to waste the time of these important ponies. Dunnie didn't mind traveling across Equestria, but it would be rather disheartening to see that the objective of her goal was to take out somepony's trash. As the group moved on she did too. When the door the the library was opened and she stepped in, she looked around the room at all the books, mouth wide in amazement, "Whoah. Are these all the books from the old library? Oh, that wouldn't make sense since the old library was blown up..." She thought for a moment on that, while walking forward, taking in the scenery more. "This place really seems bigger on the inside than the outside. It's amazing." She glanced back at fire, "Also why is this Princess Twilight's favorite room? I don't actually know much about her. Also I've never met her." She gasped, "Are we going to be able to meet her today?! That would be so cool!" "Ooooo." Went the unicorn as she listened to Fire walker's explanation, "So the map is able to observe anyone and anything and then come up with a solution by bringing others together? I wonder if such a function could be replicated with magitech. " The prench pony rubbed at her chin in thought before they finally came to the library room. 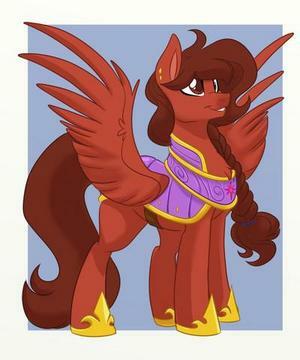 Bevel was a mare who could appreciate a good library, she had one of her own back in Talonopolis. This collection put hers to shame! She made a mental note to try and expand her library later when she got back home. Already, Bevel was at the shelves scanning the spines of various books as she slid along on the rolling ladders. As she traversed the length of the shelf she let out a subdued, "Weeeeeee~" until she came to the end and slid to the bottom, "Hmm... Dimensionally transcendant space and able to monitor individuals across the world! Thank goodness this place didn't pop up in Talonopolis. None of the families would have it!" On some level, Bevel probably would have found it concerning too. Unless she was one operating the thing. "I don't suppose the princess would mind me taking a couple readings next time I come by, would she?" She followed her friend along as she checked out the impressive collection of books. “From what I’ve heard, most of her books were lost, although I have a feeling some of her spell-books were safe due to the protection glyphs placed by their creators.” There were just some books you were never going to get back. There will probably always be a new copy of ‘Daring Do and the Marked Thief of Marapore’ and ‘The Colt in Crimson: A Shadow Spade Mystery’ laying around in bookstores. While some, there's just one copy out there. Those needed to be protected at all times! "Meeting the princess? Erm. ", What the heck did she and Spike rush off today? "Depends on what she had planned.....But if you ever want to stop by and lend us a hoof, just say so..", she smiled, "You're a pony of many talents...From training new recruits with your mad sword skills, to teaching a few of us on how not to burn the kitchen down...As you know my family's dreaded curse. ", she added with a wink. Imagine if she snagged her fuzzy brown buddy to become the castle's official chef. Dunder never met the purple princess? Really? She tried to remember all of their little adventures together. And he was raised in Solstice Heights...Not Canterlot. "Well, she really likes books. Like really really." Loud..happy sounds...almost orgasmic sounds were coming from the entrance of the castle a few days ago. Believing that the princess finally found an very special somepony, the former R.E.A guard tried her very best to sneak quietly from the kitchen to her bedroom without alerting her boss. However, an Alicorn could probably hear a bunny sneeze on the moon. Before she could hightail to her place, the purple mare caught sight of the red Pegasus pony and was very happy to point out that her new books had come in! Yikes! "I'd probably not want to go messing around the map with your magic...It might decide to send you off on a mission of your own..And considering your talents, I doubt it would difficult to find the right quest.." Wait a second, where the heck did Bevel go? 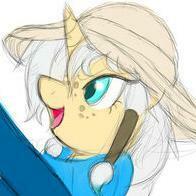 Fire glanced towards the stacks and caught sight of the brainy mare as she frolicked among the ladders. This was something Pinkie Pie would be seen doing. Normally Lore Weaver would shoosh the fuzz off her back until she stopped. OOC: Yes, Twilight likes books..